Complete pre-press works are executed in a modern studio on a first-rate device Apple Macintosh. We pay attention to professional technical processing with application of all modern technologies (quality scanners, digital photo, and digital print), accommodating approach to the customer and also high flexibility of work. 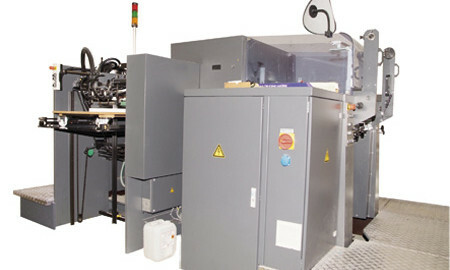 The print outputs, the so-called lithography, are realized on an exposure unit DOLEV 4 PRESS (CTF technology). CTP unit is LOTEM 400 with a proved technology of CREO company. The thermal technology permits to expose both 1% and 99% raster on the board. The assembly carried out by special software according to the desired print technology and cutting out of pages is also taken for granted. We put the coloured control preview of processed order at ones disposal prior to the board exposure on CTP. 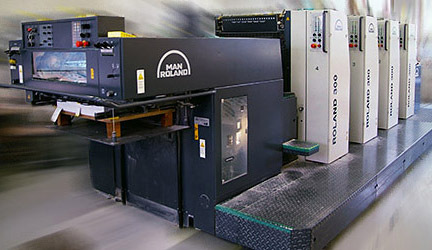 Four-coloured offset machine MAN Roland 304 of German producer is characterized mainly by high quality printing of chocolate-box materials and together with the control panel that is among others equipped with densitometer with the regulation and control of colours it ensures high quality of all prints. The rich equipment of the machine, qualified stuff, air-conditioned and tempered shop floor is a sufficient guarantee during the production of your prints. Machine equipment: infrared drying SEKOMATIC, colour control CCI with automatic densitometer GRAPHOMETRONIC, semiautomatic board filling CPL, automatic washing of inking arrangements, offset blankets and impression cylinders by means of programmable brush washer, control and managing system PECOM for data processing CIP 3, ionization device, fully automatic pressure and dusting adjustment. 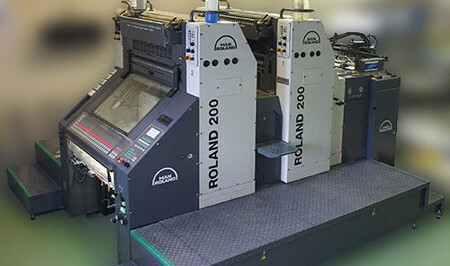 Two-coloured offset machine MAN Roland 202 with remote ink fountain control. 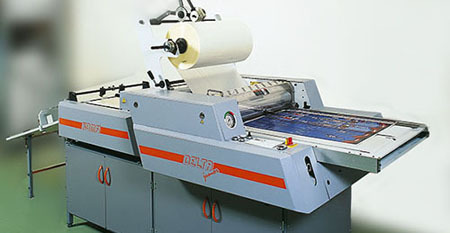 Computer-controlled cutter SEYPA 132 TV includes a jogger automat SHV 50. The combination of jogger and computer control ensures maximal accuracy of individual cuts and also during periodically repeated orders thanks to the memory of control computer. Maximal size of cut material: 1330 × 1320 mm. The line serves for making the bindings V1 with two standard fasteners or two fasteners for putting in the file. Parameters: the sheets are gathered, stitched, folded, pressed and trimmed. It is also possible to gather individual sheets or folders with maximal format of 350 × 500 mm. Minimal binding size: 70 × 70 mm. 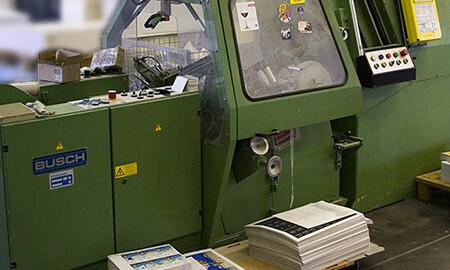 The electronically controlled folder machine Guk can both fold and perforce prints. The device disposes of 4 parallel pockets and two knives. Minimal paper stock weight: 50 g/m2. The possibility of lapels on the dust jacket – front and back. Extrusion automat Busch ensures label production of different shape and print production. It is characteristic of high speed during extrusion. You can find the archive of extrusion knives here. 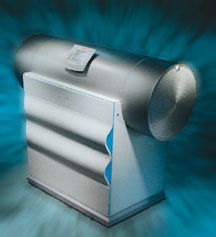 Lamination device serves for one- and double-sided lamination. The lamination is thermal and it can be done with glossy or matted laminating sheet. Platen press serves for cutting, creasing and perforating the prints. You can find the archive of cutting knives here. 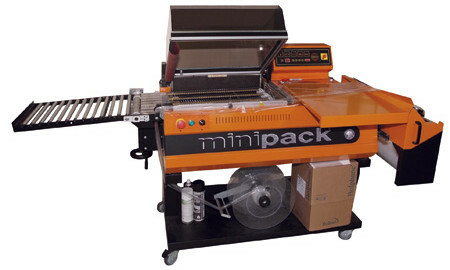 On the packing device we can shrink-wrap hot orders piece by piece (smaller series) or in different quantities. Tempered paper store with stable humidity and temperature. Ford Tranzit – we take the transport of the order to your address for granted.